Since they first became a regular component of retail design around the mid-19th century, mannequins have come to reflect society’s changing attitudes to the human form. What’s more, mannequins have transformed the shop window into a performative space. The word itself originates from France, and describes a model or dress form standing in for the human body, which is used by retailers to fit and display clothing. It comes from the Flemish word manneken, which is generally understood to mean ‘figurine’, but translates literally to ‘little man’. Before the industrial revolution, shop mannequins were seen primarily as a behind-the-scenes tool of the trade, designed without heads and used for the practical purposes of dress-fitting and tailoring custom suits. As technological advancements brought about the production of industrially manufactured, off-the-rack clothing, mannequins used for tailoring purposes fell out of widespread use. However, the production of clothing made to standard pattern sizes—intended to be worn without significant alteration and sold in finished condition—didn’t mean the end of mannequins. Evolving from a headless doll to a figure more obviously modelled on the (female) human form, mannequins began to move out of the fitting room and onto the shop floor, becoming a vital component of retail design. This marked the beginnings of what we now know as the shop mannequin, display models built for potential shoppers to review their clothing choices. They were heavy—constructed from wood and wax—but strived for realism, designed to reflect the gender of the clothing they were displaying. Many even featured false teeth, glass eyes and real hair. With the introduction of papier maché mannequins by the Parisian company Siegel & Stockman, the postures of shop dummies became less stiff, with movable limbs and motionable poses. At the same time a new, nuanced but idealised body form emerged for these dolls. Figures thinned, as mannequins conformed to the popular art deco style of the times; female mannequins’ elegant shape reflected a glamorised figure that was straight-up and boyish, with elongated necks. The glamourous facial features of the so-called Gaba Girls—a style named for their designer Lester Gaba—had high cheekbones and heavy make up, a look reminiscent of Hollywood socialites Marlene Dietrich and Greta Garbo. This was the first era of retail design which made art of the mannequins themselves. In 1932, Gaba created ‘Cynthia’, a mannequin complete with realistic imperfections like freckles, pigeon-toes and differently-sized feet. Gaba even posed with Cynthia around New York for a Time Magazine photo spread to demonstrate how lifelike his mannequins had become. Owing largely to wartime rationing, mannequins during the Second World War became slimmer and less decorative. To save on resources, they were also made shorter: around 5’3” for women and 5’9” for men. But the wartime period saw more lasting changes, with the first plastic mannequins created by designers Maury Wolf and David Vine. It wasn’t just mannequin design that changed, but overall retail design too; focus shifted away from the clothes that the mannequins wore, towards the wider scenes in which they wore them. Window displays depicted a more conservative social order, portraying a male hero or breadwinner, and his devoted family. In the US, Mayorga Mannequins introduced their own line of ‘Welcome Home’ mannequins, featuring the outstretched arms of a smiling wife and doting daughter, delighted to see the man of the house returning from the war. The countercultural movement of the sixties led to mannequins depicting more realistic (albeit still skinny) body forms in realistic postures. There was a return to the stylised elongation of the art deco age—the thinning of limbs and body contours to uphold the stick figure form. Evolving from the celebrity-modeled dummies of the sixties, mannequins in the seventies became increasingly abstract and faceless. It was the beginning of the largely faceless forms and monochrome colours which continue to inform mannequin design to this day. Now, there was an increased focus on artistry, not realism. Designer Ralph Pucci broke away from tradition by working with sculptors like Michael Evert to introduce movement and athleticism in retail displays, even posing the mannequins in handstands. Others were more abstract, such as the brightly-coloured, one-eyed, smiling figures created in partnership with artist Kenny Scharf. By the advent of the eighties, mannequin design had shifted even further away from anything that resembled a living human. 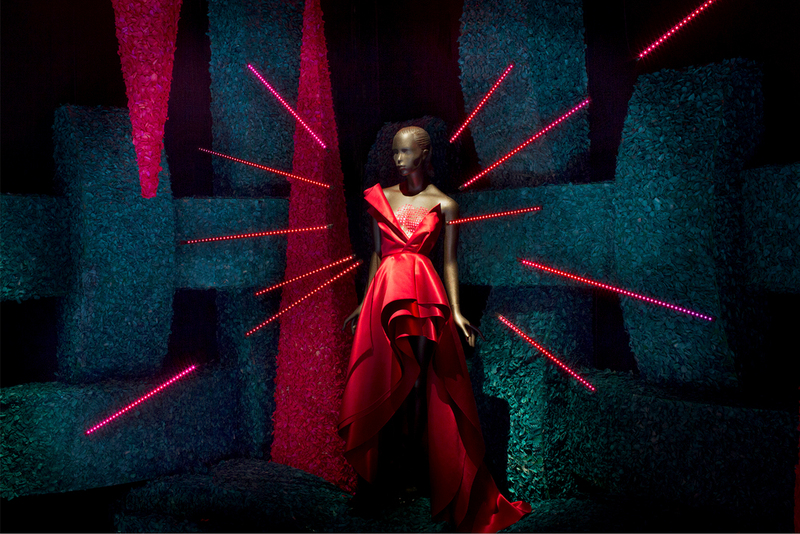 Simon Doonan, former creative director of Barneys, portrayed an especially abstract aesthetic in his fanciful window displays, which featured faceless stylisations and eggheaded designs. 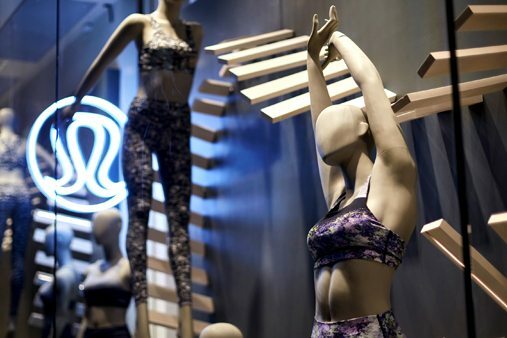 Mannequin trends changed again with the health and fitness boom of the late eighties and nineties, returning to realism, and taking on a more athletic quality. Pucci’s model, The Olympian Goddess, captured the essence of this movement towards more confident and empowered women. By the time Kim Cattrall starred in the 1987 film Mannequin, models had emerged with toned features, a straight shoulder line and a renewed emphasis on healthy proportions. Meanwhile, as plus-sized retailers and fashions gained popularity, models which more closely resembled the average female figure began to appear. This level of realism in retail design has cycled in and out of fashion for years, and it is clear to see how the history of shop mannequins and retail display has mirrored the views of contemporary society. For now, we seem to be moving in the right direction—in 2007, a law was enacted in Spain forbidding the use of mannequins smaller than a size 6—and some retailers have been called out for peddling a stick-thin fantasy that is utterly misrepresentative. Consequently, there’s been a reemerging diversification of the ‘standard’ mannequin form. Once again, we’ll see mannequins change to adapt to societal attitudes of the time.